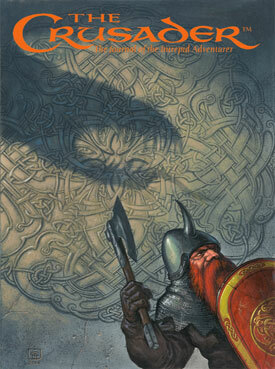 The Crusader’s May 2008 (Volume 4 Number 9) arrived at my house over the weekend and I’ve been slowly digging in. First of all, I want to say that I really love this gaming magazine. It is devoted to the concept of old-school Dungeons & Dragons in its latest incarnation, Castles & Crusades.It has fantastic, old-school, color cover art (this is where the color should be) and a well-put-together, black-and-white interior (this is where color is NOT needed….let’s keep the costs down people). Its just long enough (32 pages), contains some new info, some throw-back stuff, and an adventure (this month) to boot! Very nice all around. Revenge of the Skobbits – goofy color comic on the inside cover that’s sure to appeal to any who revered Wormy or its ilk. How it All Happened – more from the late Gary Gygax on his youth and the beginnings of D&D. I really miss Gary being around and well, I have no words poetic enough to describe just how much he meant to me. I’m not sure how many more of these columns Gary got to write before passing on, but I know his death will really hit home when I see the first Crusader without his input. Alea Iacta Est – Stephen Chenault’s thoughts on how 4E is a good thing for all concerns…He comes across as a bit of a blow-hard in this, but that’s never bothered me…..I mean, Gary came across as a bit of a blow-hard in much of his writing. If that really bothered me, I’d have never finished the original AD&D DungeonMaster’s Guide. And I’m a bit of a blowhard too….Anyway, and to be fair to Stephen, I think he expresses a lot of really great ideas in this editorial. Hammer & Anvil – Casey Canfield’s campaign setting continues to take shape. I’ll be interested to see where he goes with this. A Starsiege ad ov note….Can’t wait to see this in print…. The Aihrdian Chronicles – I haven’t finished this yet, but from what I’ve seen, Stephen Chenault seems to be doing some fine fiction as well as fine game design. Castellan’ sGuide to Arms and Armor Ad – WTF, is this 3.5? The Angry Gamer – Stupid Names piss him off….and me. Moat Gate – Don MacVittie updates us on the Moat Gate product of Yggsburgh…. The Dweomercraefter’s Den – Gary and Jeffery Calanian on Zagyg Castle…interesting history. And finally, Slippery Slope – A Joe Damiani adventure. To be honest, I have only skimmed this. I have high hopes and really would like to see this sort of thing be a regular in The Crusader…..I’m assuming it rocks….if it doesn’t you’ll hear about it soon. Auld Wyrmish – Mike Stewart’s…um errata from…like the last issue….wasn’t this handled online? I think this was a wash for me. Anyway, I did really enjoy the magazine. I give it a solid 8.